Sinker's gap is not allowed! Ultimate stopper of tungsten era! 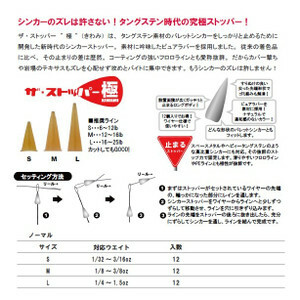 The stopper pole" (Kiwami) is a new era sinker stopper developed to firmly stop the Barrett sinker of tungsten material. We adopted pure rubber which examined the material. Compared with conventional colored articles， the difference in stoppage is obvious. Excellent nickname for the strong Fluoro line of coating. So you can concentrate on the bite with attack and without worrying about slippage of cover shootings and rocky Texas. I will not forgive sinker shift! ■ Recommended line S ... 6 to 12 lbM ... 12 to 16 lb L ... 16 to 25 lb"